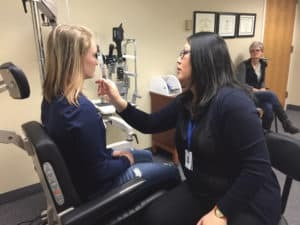 The Traumatic Brain Injury (TBI) Outpatient Program uses an interdisciplinary approach toward providing unique and individualized treatment to patients with traumatic brain injury and their families, with a goal of improving their quality of life. Our expertise spans the entire continuum of brain injury severity, from mild TBI / concussion to severe TBI. The program serves people ages 13 and older with cognitive, physical and/or psychological impairment resulting from their injury. Children ages 12 and under are cared for in our Pediatric Brain Injury Program. Over 16,000 TBIs occur in the state of Minnesota annually. Over 85% of these are mild TBIs, also referred to as concussions. Symptoms of a mild TBI can go unrecognized and untreated. When seen by a specialist in TBI, people experiencing symptoms can get better faster and avoid long-term chronic complications. After a thorough examination and cognitive screening, a customized plan of care is developed to address your specific areas of concern. A TBI nurse is available to answer questions about your medications or plan of care. Each team member will perform an initial evaluation and establish an individualized treatment plan based on your needs. One of the most common reasons people come to the Traumatic Brain Injury Outpatient Program is the frustrating sense that "something just doesn't feel right". It is often the unexpected symptoms from a TBI that can be most challenging to deal with. If you find you are now struggling with any of these symptoms please make an appointment. Mild, moderate or severe, they are all serious, even when called concussion. Brain injury symptoms can appear right away or in a few days. Not all, but many brain injuries can be avoided. Hennepin Healthcare is a leader in cutting edge research. Brain injuries in seniors who fall are often overlooked. Rehabilitation after a brain injury can be tough - we are the right partner.